An exquisite memoir about how to live--and love--every day with "death in the room," from poet Nina Riggs, mother of two young sons and the direct descendant of Ralph Waldo Emerson, in the tradition of When Breath Becomes Air. "We are breathless, but we love the days. They are promises. They are the only way to walk from one night to the other." Nina Riggs was just thirty-se An exquisite memoir about how to live--and love--every day with "death in the room," from poet Nina Riggs, mother of two young sons and the direct descendant of Ralph Waldo Emerson, in the tradition of When Breath Becomes Air. "We are breathless, but we love the days. They are promises. They are the only way to walk from one night to the other." Nina Riggs was just thirty-seven years old when initially diagnosed with breast cancer--one small spot. Within a year, the mother of two sons, ages seven and nine, and married sixteen years to her best friend, received the devastating news that her cancer was terminal. How does one live each day, "unattached to outcome"? How does one approach the moments, big and small, with both love and honesty? Exploring motherhood, marriage, friendship, and memory, even as she wrestles with the legacy of her great-great-great grandfather, Ralph Waldo Emerson, Nina Riggs's breathtaking memoir continues the urgent conversation that Paul Kalanithi began in his gorgeous When Breath Becomes Air. She asks, what makes a meaningful life when one has limited time? 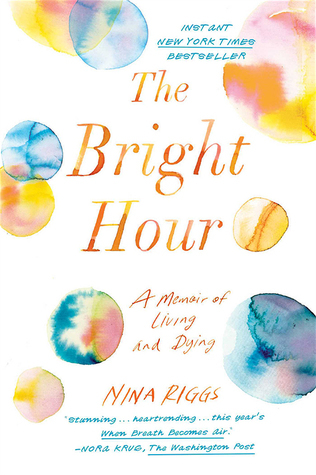 Brilliantly written, disarmingly funny, and deeply moving, The Bright Hour is about how to love all the days, even the bad ones, and it's about the way literature, especially Emerson, and Nina's other muse, Montaigne, can be a balm and a form of prayer. It's a book about looking death squarely in the face and saying "this is what will be." Especially poignant in these uncertain times, The Bright Hour urges us to live well and not lose sight of what makes us human: love, art, music, words.